Suggestions had been made for the controversial celebrity to face the law for threatening to bomb White House, the official residence of the president of the United States of America. There is no doubt that Madonna do not have love for the new president of America because it is assumed he is not the right man to lead the US to her "dream land" and his ideologies are rigid, so on this circumstance, a lot of people online has called for the star singer's head while some others actually called it a mere threat of words and said the woman should be let to flex her right to speech. 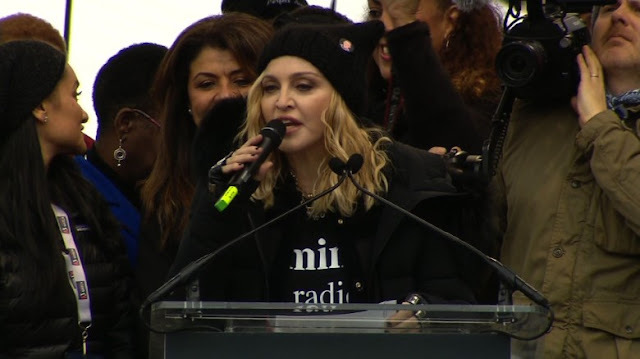 At the Washington's women March, Madonna addresses over 500,000 women and on this exact sentence, she said, "I had considered blowing up the White House. She continues; “Welcome the revolution of love. To the rebellion. To our refusal as women to accept this new age of tyranny,” Madonna, 58, said. “Where not just women are in danger, but all marginalized people. On social media, Twitter precisely, A group who term them-self as patriotic Front has said that Madonna should face the music as she is not above the law. However, a lot of people have backlashes the group, insisting that Madonna have her freedom of speech intact. Well, freedom of speech is one thing while freedom after speech is another. Let's wait and see if the authority will ignore her or ensure she is "dances to the music" prosecuted.